0.1 Gran Canaria is quite the party island. But where should you consider celebrating the arrival of 2017? Check out the impeccably-researched recommendations in our New Year’s Eve 2016: Gran Canaria guide. Gran Canaria is quite the party island. But where should you consider celebrating the arrival of 2017? Check out the impeccably-researched recommendations in our New Year’s Eve 2016: Gran Canaria guide. Winter is high season on Gran Canaria, particularly for our friends from the cold, cold climes of Scandinavia. So, if you’ve come here to beat a retreat from wintry chill; we’ll show you the hottest places to see in 2017 at. With no further ado, here’s our five-part New Year’s Eve 2016: Gran Canaria overview. The bright lights of big city Las Palmas de Gran Canaria are the biggest draw for NYE revellers. There’s a wide selection of formal and informal events. Both indoors and out. Las Canteras, as always, is a focal point of celebration. Witness the New Year’s Eve dinner and party at Auditorio Alfredo Kraus. The dinner comprises a welcome cocktail and nibbles including Canarian cheese brochettes with passion-fruit jelly, a sit-down meal starting with cream of lobster soup topped with julienned crab and toasted almonds, and a glass of champagne and 12 lucky grapes to eat in time to the chimes of midnight on the Canteras terrace. Post midnight, the party continues until six in the morning in the Sala San Borondón with a free bar, a DJ set, and performance from rockers Los Lola. Tickets are available to buy from the Auditorio box office as well as online. Up to and including the 26th December, a dinner-and-party package is priced at 135€ (increasing to 140€ from the 27th) and party-only entrance 70€ (rising to 75€ from the 27th). A rather more understated Fiesta Nochevieja takes place further down Las Canteras promenade. At La Guarida del Blues. This atmospheric venue opens its door five minutes before midnight and there’s no ticket required for the free live music performances. If you prefer dressing down to up on NYE, you might also be interested in a similarly free event being held on the other side of town. In PKDK Pub Tattoo. Expect to hear DJs Hada Verde and Malleus spinning the likes of Pixies and The Cramps on the decks at the Fiesta del Fin de Mundo. For an altogether smarter affair, head north along Léon y Castillo to reach the Hotel Santa Catalina. This five-star establishment offers a Menú de Fin de Año (featuring Valsequillo strawberry gazpacho with Bay of Cádiz shrimp tartare, pickled onions, and olive oil cupcake) followed by a Fiesta del Año Nuevo 2017 (featuring the sounds of the 80s from DJ Tony Besa and mojito bars). Both events will set you back a combined price of €260, although the fiesta alone (with free bar) is priced at €49. Another dressy NYE occasion in the capital is hosted by the Casino Las Palmas. Va Por Ustedes is dinner with a show featuring the talents of drag artists offering a blend of song, dance, magic, and comedy. €120 buys you this, an aperitif, first course, second course, palate-cleansing sorbet, third course, dessert, and bottle of wine plus a free bar serving water, soft drinks, and draught lager from 9:30pm to 5:00am. You’ll also need to be suited and booted at the Círculo Mercantil de Las Palmas‘ end-of-year party which nonetheless starts in 2017, at 12:30am. A €60 entrance fee includes a performance from a Michael Jackson tribute act, Gus Jackson, and a draw to win flights and hotel stays. The easiest way to purchase a ticket is online, through Entrees.es. If you want to see the new year in at the Muelle Deportivo’s open-air Sotavento Club, you’ll have to buy a ticket in advance for €16 which includes two free drinks. These can be ordered online at the venue’s official site. Entry is free from 12:·30am but you’ll need to pay extra for any drink. Bring your own booze or buy from the stalls at Las Palmas de Gran Canaria’s Plaza de Canarias in front of Parque Santa Catalina. This has a 11 o’clock start and no lower/upper age limit. A fireworks display is the highlight of this al-fresco celebration. Over in the rest of the north of the island, NYE is a quieter affair which is typically celebrated in the houses of friends and families. In Arucas, there’s an old-school €40 dinner dance at Tropical Palace. Where the melon comes with ham and the salsa in the form of Linea Latina. Elsewhere, it all kicks off in Moya, in front of the iconic Iglesia de Nuestra Señora when the church’s bells toll midnight. The scene then shifts to the nearby Carpa del Anfiteatro Municipal del Parque Pico Lomito. Follow the crowds to see Linea DJ on the turntables. Next up, let’s see what’s happening in Teror. Where crowds congregate in the Plaza del Pino around 11:30am, in time to hear the chimes of the Basílica’s bells. Before continuing the revelry into the night with DJ Ulises and soft rockers Últimate Llave. Which leaves Vallesesco. Despite its name, expect a wet end to the year in Dry Valley. The municipal capital’s Casa de la Cultura is the venue for the fiesta which starts at 11:30pm and includes equal distribution of the grapes of fortune. Down south, join the beautiful people at Playa del Inglés’ Pacha Gran Canaria moving their bits to the hits of this year’s dance music from 11:00pm to 7:00am. Book in advance for €20 by email (reservas@pachagrancanaria.com) or through WhatsApp (691 236 181) by 29th December and receive two free drinks. Get one free drink for the same price by paying on the night at the door. Also, in PDI, Atelier Cocktail Bar puts on La Dolce Vita from midnight to 3:00am. Featuring the sweet, soulful sounds of deep-house aficionado DJ Swamy. And a chance to sup on selections from a special menu of cocktails whilst you enjoy a rooftop view of the public fireworks. Meanwhile, in Meloneras, the stylish Aqua Ocean Club is offering a two-tier Fin de Año. For €50, you can order from the standard selection of alcoholic beverages at a free bar. Pay a €20 supplement on top of that, however, and you can cut your mixers with premier-label gins, rums, vodkas, and whiskeys. The municipality of Mogán has set up three main bases for NYE. And so whilst Mogán old town’s Plaza Sarmiento y Coto plays host to the likes of Güira Latina, Plaza Dr Pedro Betancor León in Puerto de Mogán sways to the rhythms of Yoni y Aya. Güira Latina also play Arguineguín’s Plaza Pérez Galdós along with DJ Samu González, specializing in commercial house. Party animals will also be able to feast in the east of the island. At the likes of El Cortijo in Telde’s Purity Golf Fin de Año. The cheaper €35 tickets might have gone but there are €45 ones available should you want to join the young uns dolled up in cocktail dresses and dinner jackets. For a freebie NYE, how about Ingenio‘s Fiesta Fin de Año 2016? Zona 1 in the Plaza de la Candelaria sees DJs Paco Sánchez and Fano Sánchez whipping up the crowd from 11:30pm to 7:00m. Whilst Zona 2 in front of the town hall features funky trio Star Music and keyword wizard Yeray Socorro from 12:15am to 6:15am. 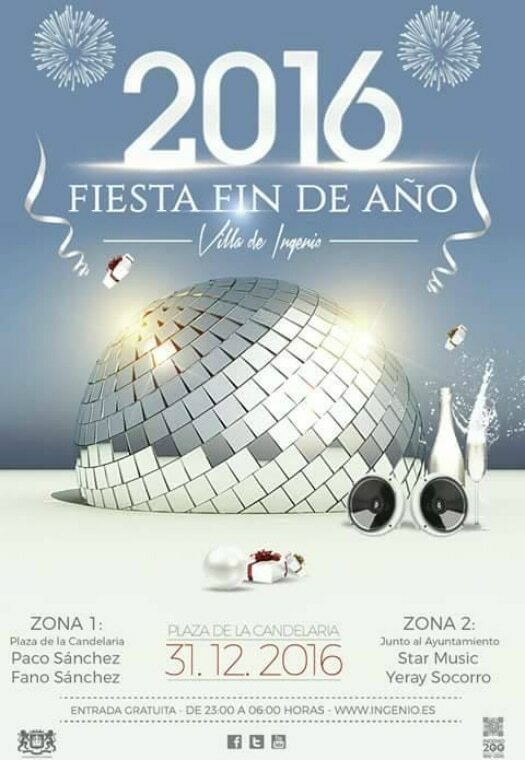 They’ll be celebrating NYE in front of the church in La Aldea de San Nicolás from 11:30pm. Along with the traditional grapes, you can toast 2017 with the non-traditional cider which replaces the similarly bubbly cava. DJ Nichel B will be entertaining the hordes with some reggaeton and there’s also a show from the percussion-heavy Orquesta Panamaribe. NYE’s a simple affair in Artenara. At quarter to midnight, they’ll be doling out grapes, party hats and streamers in Plaza de San Matías in anticipation of the parish church’s confirmation of 2017’s arrival. A truly beautiful setting on the island to see in the new year. Over in neighbouring Tejeda, the Parador de Cruz de Tejeda are promoting a special New Year’s Eve 2016 offer. From €385, you can enjoy a three-night stay at one of the island’s leading rural hotels. Along with a room, you receive buffet breakfasts, dinners including the Cena Especial Fin de Año which includes a free bar, and the obligatory NYE party pack.